If you're a Toshiba collector, or just a transistor smartypants in general, you'll no doubt notice that most of the models in this Toshiba gallery have been assigned manufacture dates, many of which don't agree with those found in the price guides -- so what gives here? 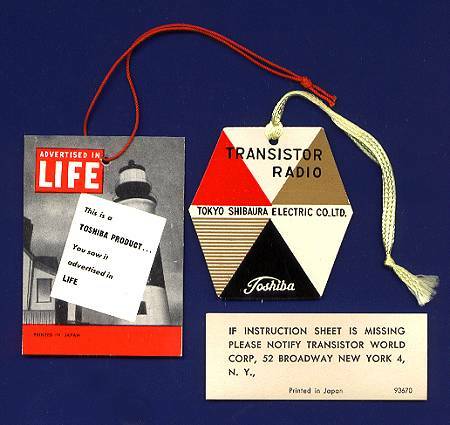 Since then a "hunch" was proposed by collector Fred Mason in early 1997: The hunch was that Toshiba placed production dates within its serial numbers, but since Fred only had three Toshiba transistor models, he really couldn't say for sure. I sent him a list of serial numbers for 29 Toshiba models in my collection, along with my guess of what the coding scheme was -- and for him (and for me), this confirmed the hunch. 3. The five remaining digits are the "core" serial number. this would mean that it was set number 512 produced in August, 1960.
a. For each set the first digit is either 9, 0, 1, or 2 -- as in 1959, 1960, 1961, 1962 (and 3's & 4's of course would refer to '63 & '64 sets).